648 pages | 100 B/W Illus. 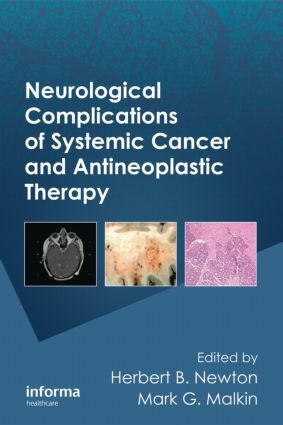 Neurological Complications of Systematic Cancer and Antineoplastic Therapy provides an in-depth review of common manifestations related to neurology that occur in patients with systemic cancer. These include brain metastases, spinal cord compression, cerebrovascular events, and leptomeningeal disease. The book also discusses less common complications such as paraneoplastic disorders and neoplastic plexopathy. Additional chapters review problems related to each specific tumor type, such as breast, lung, and colorectal, as well as gynecological cancer, genitourinary cancer, and malignant melanoma. The book also discusses neurological complications related to treatments such as radiation and chemotherapy. Bringing clinical trial knowledge from the bench to the bedside, this volume is an essential reference for the practicing oncologist and neurologist. Herbert B. Newton, M.D., is Professor of Neurology, Co-Director, Dardinger Neuro-Oncology Center , Esther Dardinger Endowed Chair in Neuro-Oncology and Director in the Division of Neuro-Oncology at the Ohio State University Medical Center, Columbus, Ohio. Dr. Newton is also an Attending Physician in Neuro-Oncology at The Arthur G. James Cancer Hospital and Solove Research Institute and Staff Physician in the Section of Neurology at the Children's Hospital of Columbus. He is a diplomate of the American Board of Psychiatry and Neurology, a Fellow of the American Academy of Neurology and Royal Society of Medicine, and a member of numerous national and international societies. Mark G. Malkin M.D., is Chief of the Division of Neuro-oncology in the Department of Neurology, and Professor of Neurology and Neurosurgery at the Medical College of Wisconsin, Milwaukee, Wisconsin. Dr. Malkin is also on the active staff of Froedtert Memorial Lutheran Hospital, where he serves as Co-Chair of the Cancer Committee. He is a Fellow of both the Royal College of Physicians of Canada (Neurology) and the American Academy of Neurology. In 2005 he received the Excellence in Clinical Teaching Award from the Department of Neurology at the Medical College of Wisconsin.